Did you accidentally delete contact(s) from contact list in your Gmail account? 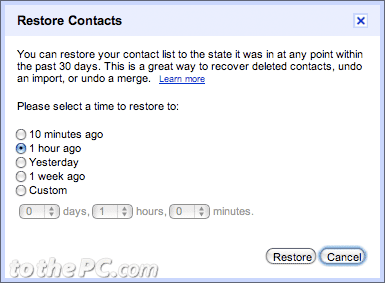 You can easily recover deleted Google contacts using ‘Restore contacts’ feature. Just like System Restore feature in Windows, you can restore contacts list to any previous time like 10 minutes ago, 1 hour ago, yesterday, 1 week ago or specific date. 1. After Gmail login, click ‘Contacts’ option on top left sidebar to open Contact Manager. 2. Then click ‘More Options’ and click ‘Restore Contacts’ option. 1. Recovering contacts that have been accidentally deleted. 2. Restoring contacts after an unsuccessful sync. 3. Undoing a recent import or a recent merge.